Under way again in about 22 minutes when you'll be guided through the action by the estimable C. Rattue, who is busy doing his pre-stint calisthenics at his desk. About to resume, conditions slightly darker, and suggestions of showers nearby. 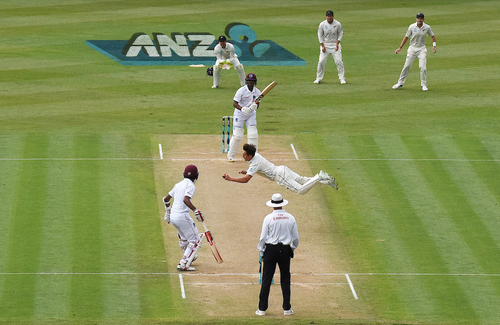 Great straight mid-on shot from Hetmyer the highlight, facing Boult. Bowler response: a bouncer, backed by leg slip. De Grandhomme gets the fairly new ball - hurling it down at about 128kph. Seen quicker things in the Waterview Tunnel (just kidding officer). Previously...Boult dished up a half volley, Hetmyer flung it through the covers for three. Hetmyer carving Big Col up...smacked CDG for a couple of boundaries, plus a comfortable pull shot for a single. Hetmyer on the charge here. Genius...truly great Trent Boult catch, off Hetmyer. The ball stopped a bit, leg side, and Boult dived full stretch to his left, to grab it. Wonderful. Shai Hope to the crease. Neil Wagner has the ball...the short pitch specialist about to unleash his customary barrage no doubt. Brathwaite swiped wide Wagner deliver to cover boundary, then top edged a hook over fine leg boundary. Big over for Windies - 12. Windies continue to score well and attractively. You still feel chances will come though. Wagner's line is poor, Brathwaite takes advantage. Then Wagner blames the ball...gets the umpires to check out the shape. And yes, it is out of shape. It fails the shape test, dismally. If Wagner could bowl a bit better, the ball might not get smashed out of shape. It wasn't a catch, but Blundell puts down a simple take after a bat flourish from Brathwaite. Then the ball falls just short of Southee at third slip. On reflection, that probably rates as a chance. The cordon behind the wicket not in best shape, with Latham's earlier howler off Boult. Wonderful swivel-crouch pull shot from Hope for four. Wagner non threatening. Not enough bounce, which turns his 135kph type deliveries into fairly ordinary test fare. Leggo - have the Windies figured Wags out? Wow...great pull shot from Hope for six...Wagner did find a bit of extra bounce at two points in the over. RAIN delay. Players walking off the field, covers out. Ratts I think we've just seen the answer but with a qualifier in my book. Wagner is now 4-0-32-0. The batsmen have sweated on the short ball and jumped on him. But Wagner is a guy who has days like this sometimes. Remember the Basin last week, seven for 39 in the first innings then at stumps on the penultimate day he had gone for about 80 off only around 16 overs. He seems one of those bowlers who is either a handful or the batsmen reckon 'bring him on'. Weather not getting better...big sheets coming out. The rain is haulting an onslaught here. Like I told David before, Wagner is going to take some licks or get some more wickets. Ratts we're going to be off for a while, grey all round the Tron, and importantly not much breeze to blow things along. This was forecast to be fair, just a case of when. If I was a betting man, which I'm not any more, I would suggest this could be it for the day. But I don't think it will necessarily impact on the outcome in the test, and by that I mean the game is travelling along reasonably well, still three days left and we know much can happen in that time. One thing to ponder my old mate, do you remember Boult's dazzling return catch to dismiss Mitch Marsh at the Basin a year ago? In my book that was better than today's effort to remove Hetmyer. My mind tells me that ball was travelling faster and he had to move further than today. Not to dismiss today's athletic effort. Thoughts? Fair call. The ball did stop a bit on this occasion - then again, that doesn't necessarily make it easier to hold. Sometimes the quicker ones "stick", or so I am led to believe. With rain setting in Big Niall Anderson will take over the reports when the cricket resumes. Not good. Although if you want to clutch at straws it is lighter. Nothing doing for at least an hour in my book, probably longer. Rain cut short a fascinating middle session on the second day of New Zealand’s second test against the West Indies at Seddon Park today. The West Indies, responding to New Zealand’s first innings 373, had got to 87 for two off 21 overs when the rain, which had threatened for an hour, arrived at 2.33pm. The heavy covers were rushed out and the outlook for play in the final session is grim. The Windies resumed after lunch at 24 for one, having lost opener Kieran Powell for a duck before the break. Stand-in captain Kraigg Brathwaite and little lefthander Shimron Hetmyer took the score to 46 before Hetmyer chipped a catch back to bowler Trent Boult and he dived to his left to clutch a spectacular one-handed return catch. Hetmyer had looked good, getting off the mark hooking the same bowler for six, then clattering a four through mid off and chipping another boundary over mid wicket. 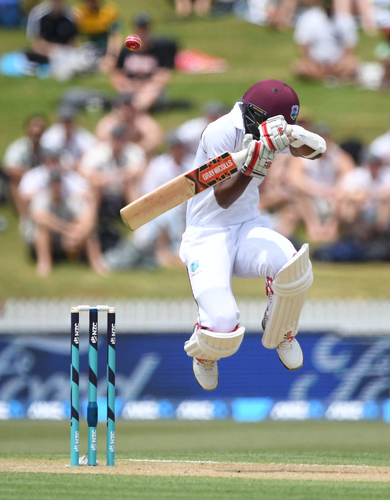 Brathwaite got stuck into left armer Neil Wagner, who had taken nine wickets in the first test at Wellington last week. Shai Hope got off the mark pulling Boult to the mid wicket fence and the pair had put on 41 entertainingly when the rain came. When play resumes, Brathwaite will be on 45, off 59 balls, and Hope is on 14. Boult has one for 32 and Tim Southee one for 13. Can report covers are being peeled back. An inspection due at 4pm. Play can run until 7.30pm so we might get a bit more today. Slightly brighter too, which is not to say bright, just brighter than earlier. Restarting at 4.20pm. Rapid recovery. Almost time for the restart of play. Players coming back on the field now. Tidy maiden over for Southee. The delay would've benefited NZ since the Windies had the momentum before the break. Half-chance for a wicket there. Brathwaite edges Wagner but it falls just short of Taylor at first slip.